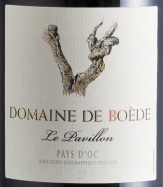 Le Pavillon whose main grape variety is the Cinsault, is the only red IGP that we sell. It is supple, round and easy to drink in any situation. Hand-harvested, Hand-selected at optimal ripeness. Dark ryby-red. On the nose, the wine shows a great complexity with notes of red ripe fruit, rasberry, cassis and a touch if spices, black pepper and cinnamon. The palate is round and generous, tannins are silky and perfectly balanced, with notes of licorice on a very long and elegant finish.